Today’s society demands a safe, secure environment for all students and faculty of K-12 schools. As a major provider of identification, security and Visitor Management solutions, Fullidentity has been assisting schools with implementing above standard security measures for decades. Fullidentity’s wide range of security solutions for schools vary from student identification cards for a large high school to comprehensive Visitor Management software for a local middle school. At Fullidentity we belief a successful school is a safe school and properly identifying visitors on school grounds and restricting those who are uninvited is a must. From technology to ordering cards, Fullidentity makes it easy for your school. We understand the ease of functionality that is needed to keep a busy school running smoothly. Whether ordering cards for thousands of students or ordering a card for a latecomer, we’ve created our system to work with any size order. Even an order of just one student ID card doesn’t change the price of the card and it will still be shipped to you within 48 hours. Fullidentity offers a variety of ID badges and cards that can be used as student ID card with amazing features such as barcodes and magnetic stripes allowing payments in school cafeterias. 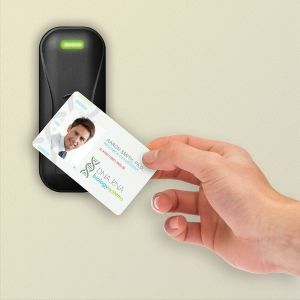 Smart or proximity cards will allow teachers and staff access to teacher lounges, supply rooms or staff offices. Our Premium Design Service will help you create a professionally designed custom card. Fullidentity’s line of card accessories effectively attaches a badge or card to its carrier’s person while offering customization capabilities for lanyards or badge reels. Show your school’s logo and your school pride by displaying the school colors and logo. Fullidentity.com could be exactly what your school needs to reduce the hassles of multi-location ordering. Our staff is ready to help you successfully set up customized, need-based software solutions for your schools as we’ve done for many other prominent schools.